﻿ Bryan Theatre - Ohio. Find It Here. 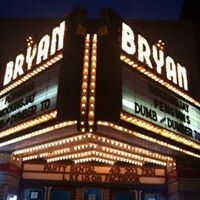 The historic Bryan Theatre is prominently located on the courthouse square in downtown Bryan, Ohio! We boast three movie screens featuring first-run movies, classic movies, and video game tournaments. Admission prices are reasonable and can be paid with cash or credit cards. You will love our free refills on popcorn and fountain soda! Check out the numerous area restaurants within walking distance for a dinner and a movie!